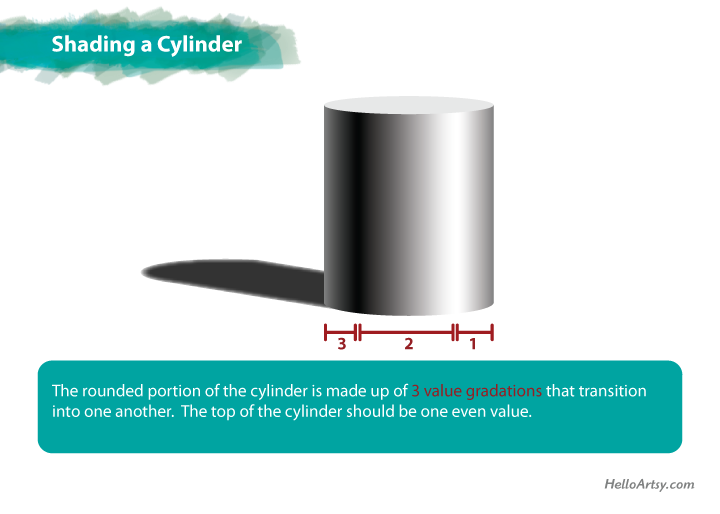 A cylinder should be drawn with an elliptical top and vertical sides that are parallel to one another. 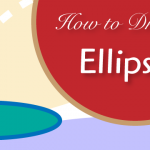 The base of the ellipse is the bottom half of an ellipse; it should be like the ellipse you drew for the top. 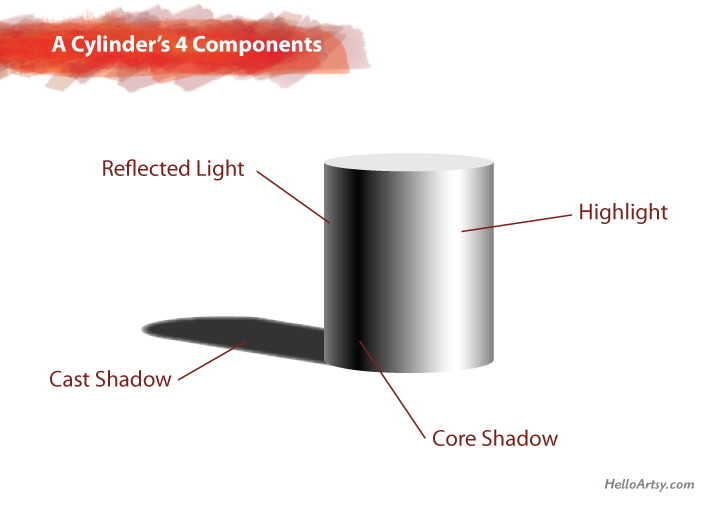 The cylinder’s cast shadow is considered to be two parallel edges that round off with a partial ellipse to connect each straight edge of the cast shadow. Make sure each parallel straight edge of the cast shadow lines up with the base of the ellipse even though we cannot see it in it’s entirety. 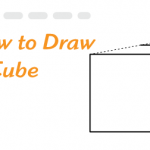 In other words, don’t make the cast shadow too wide or too narrow; observe in the diagram above how the cast shadow meets the edges of the cylinder’s base cylinder. 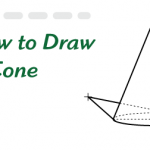 You might find it helpful to lightly draw the base’s ellipse in its entirety and erase the top half once the other parts are setup. Under most circumstances you will want to keep your outlines extremely light so that they disappear when you shade over them and around them in the next part: shading the cylinder. You will never be able to shade the cylinder adequately unless you can shade even values and graded values with ease. Please check out my post on value[LINK] and brush up on those skills first if you have not already done so. I will be using many terms from that post and you will find yourself lost if you are not well versed in the subject of value. The cylinder will consist of 3 graded values that make up the curved side of the cylinder’s wall and a single even value for the top of the cylinder. It’s good to practice drawing the cylinder with a full range of values. With that in mind, try to maintain your lightest value as white and create your darkest value black. This will make the cylinder come to life with the illusion of three-dimensions. It will also get you in the habit of using your tools to their maximum potential. Looking at the right side of the cylinder you can see a medium value that gradates lighter until you reach the highlight, which is the lightest value on the form. In this example the highlight is pure white but that will not always be the case. While practicing let’s keep our highlight pure white. Continuing leftward, the value should transition from the white of the highlight to a black value. 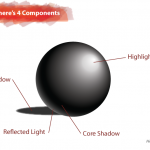 The region where the value is the darkest is referred to as the core shadow. It is black here, and you should practice drawing the core shadow as black as possible, but understand that real objects might not always exhibit a black core shadow. Now comes the tricky part. Take a look just to the left of the core shadow. Do you see it? There is one short little gradation the goes from a dark value to a medium value. The reflected light is a sneaky little devil but that’s the part that’s crucial to making things look realistic in a drawing or painting. That short little gradation is called the reflected light. It’s caused by light bouncing off other objects around the cylinder, bouncing back and illuminating the dark side of the cylinder. Consequently, the reflected light can dramatically change in size and value depending on the environment around the cylinder. For now you should practice shading from the pure black of your core shadow to a medium value against the extreme left side of the cylinder. For now you can shade the cast shadow one even value. Let’s make it a medium-dark value. For some added realism you can soften up the edges of the cast shadow by blending the cast shadow’s edge into the background. Technically this is yet another gradation but most artists refer to extremely short gradations as soft edges so I will do the same. By now I have pointed out the 4 components of the cylinder. It’s important to be able to identify these components so that you can draw them accurately in your artwork. Without these components any attempt at drawing a cylinder will make it appear flat and not very realistic. Please understand that these four components do move around depending on where the light source is located and their value (lightness/darkness) can vary as well. The best part about putting logic behind your drawing instruction is that your knowledge is easily applied elsewhere. 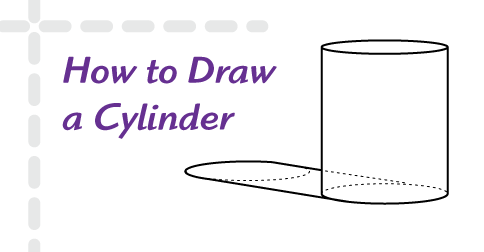 Once you can draw a cylinder you’ll understand how to draw tree trunks, truck tires, arms, and legs. It’s the concept of how light makes a cylinder look that is important. All too often artists learn a few tricks but have little working knowledge of the physics behind what they are creating. It’s important to think about art and our physical world. Each time you draw something don’t forget to think! If you made it this far you are a champ! Does the Cast shadow’s ellipse, (seen at the top of the shadow, farthest from the cylinder) have the same size ellipse that the top & bottom of the cylinder have/ Also, why does the left side of the ellipse in the Cast shadow have a bend in it on the side farthest from the viewer, where on the other side it’s only a straight line?? That ellipse that makes up the part of the cast shadow farthest from the viewer should actually be slightly smaller than all other ellipses because it is farthest away. How much smaller depends on one’s proximity to the form. That’s how perspective works, right? And to get super technical the cylinder’s top ellipse is thinner (along minor axis) when compared to the bottom ellipse. Again another visual/perspective thing. As far as the curvature is concerned with the cast shadow’s ellipse it is curved all the way around but has to join back up with the straight lines that represent the straight sides of the cylinder. It’s hard to explain in words. Two things to keep in mind Sirikirtan: 1) These are simple graphics to help beginners and some of the more advanced stuff discussed above are left out (on purpose). 2) These are web graphics and sometimes it’s hard to decipher nuances in diagrams. Glad to help! And yes don’t obsess over it too much. The important thing is to keep drawing/painting and making each work of art better than the last. You can do this by studying real objects with your own eyes (drawing from life) and keeping the theory in the back of your mind. You’ll find that some people will argue minutiae to the detriment of their own art! There’s “art forums” loaded with these people. People will waste hours a day debating over which canvas lasts longer, etc, blah blah blah… It’s very paralyzing to beginners and intermediate level artists. Yes, don’t fall for those paralyzing traps! Thanks for sticking around Sirikirtan. You have to look. I’ll give you an analogy… Imagine you’re a surgeon and you open up somebody to perform surgery…the patient’s insides will not match exactly the diagrams you studied in medical school, but because everything is in more-or-less the same area and you have studied many anatomical models under many conditions, etc you (the surgeon) will be able to make sense of what you are seeing. Knowing the components gives you a huge advantage when drawing forms. Yes you’ll still have to look and the more objects you study under various conditions the better you’ll get at rendering them. As far as value is concerned I would just treat each value relative to the values around them. Your drawing tools (especially pencil) have a hard time reaching the color/value gamut that occurs in our naturally world. Thank you so very much Mister John Morfis!! :D. That was an incredibly intelligent analogy. I love how I get to be a surgeon xD . I highly appreciate your answer/reply ! =D. Hi! Just getting started in watercolor (no artistic background but loving it!) & realize how important it is to practice the fundamentals of drawing! Drew my first cylinder but couldn’t figure out how to decide on the angle & length of the cast shadow. Can you help? The shadow’s length is determined by the altitude of the light source. If you were to draw a line from the light source through the top edge of the form, where it strikes the resting surface determines the length. 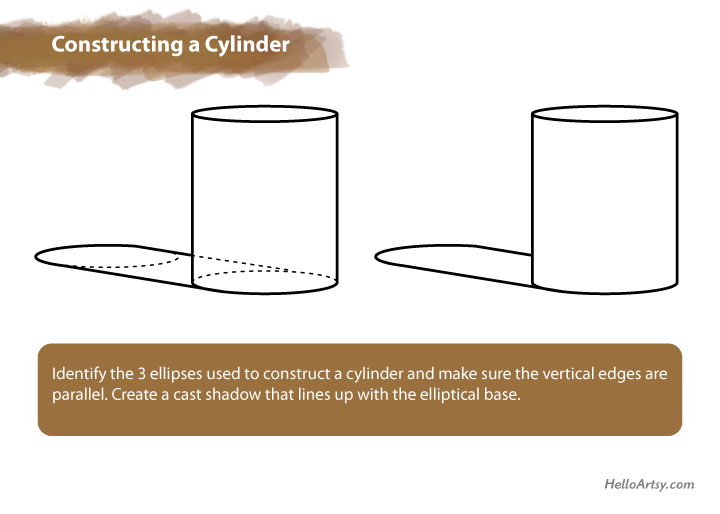 The shadow’s angle can be calculated by completing the entire ellipse that makes up the base of the cylinder. The point on the ellipse in which the highlight touches… mark that point. Then draw a line through the center of the ellipse. That line determines the angle of the cast shadow. This sounds really cool Barbara. I love how you are not afraid to combine science and logic with your art making process! Keep it up and you’ll be amazed at how far you’ve come in few years. Never in my life did I know that shading is so important and that it gives so real looking effect. I had urge for drawing since my school days. But could keep up my passion due to studies. Luckily I came to your website which is amazing for a art lover like me and who has passion to draw. Thank you very much. You are doing a great favor to people who are interesting in Drawing but don’t know how to approach. Please keep it free. Vicki, post a link to the image please.